Ruth Phyllis Somogyi, (Gilmore), age 88, passed away on Monday, May 14, 2018. She was born on September 16, 1929 in Chicago, IL to Alvis and Lenore Gilmore. She was a graduate of Austin High School in Chicago. Ruth was united in marriage on June 18, 1949 to John Somogyi. She was a member of the Order of the Eastern Star True Blue Chapter of Chicago. Ruth was a great homemaker and an excellent artist. 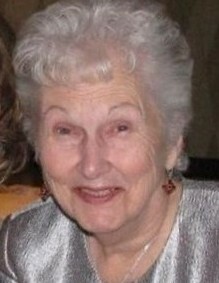 She loved her family and adored her grandchildren and great-grandchildren. Ruth is survived by her husband, John, of 69 years; children, Pamela (Dominic) Pulice and Scott (Janet) Somogyi; granddaughters, Jessica (Michael) Phipps, Amanda (Tim) Barger, Sarah (Kevin) Fitzgerald, Ashlee (Ian) Wallace, and Mallory (Albert) Kon; great-grandchildren, Trevor, Ethan, Ashton, Tessa, Adam, Nathan, Preston, William, Sean, Josephine, Maggie and Tyler. She was preceded in death by her parents, Alvis and Lenore Gilmore.